D-Log: The Perfect Fall Day! Baba turned 80 today! Happy birthday, Baba! We had awesome weather today, sunny and crisp with not so much wind. The temperature was about 58° F (~15°C). It was the perfect day for the farm trip with the girl scouts. 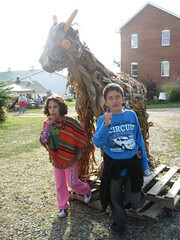 We went to Farmville, uh I mean Devine Farms, about 45 minutes east of Columbus. 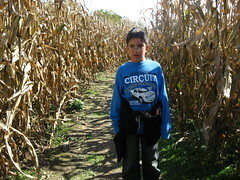 Moody lost his way in the corn maze and he and Luke had to find a way out through the corn. The trip was very refreshing, and the kids had loads of fun. 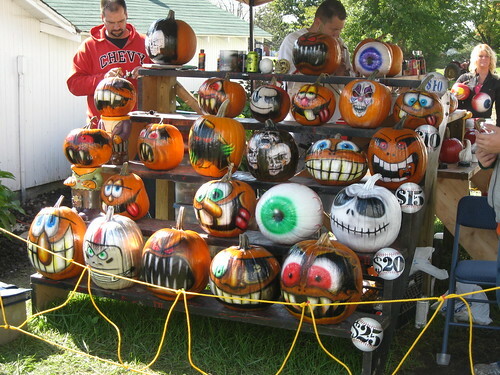 Check out the airbrushed pumpkins down below. Tomorrow it will be exactly one year from the day Mama and Baba arrived in Columbus. This time last year, Anas and Juju were here with us. We had such good times with Anas and Juju, as well as Mama and Baba. We all miss them a lot. Moody and Tala still talk about their siblings, remembering those days, and they love wearing their clothes. October the 15th will be a year since my surgery--how time flies! I can say I have come a long way in terms of recovery. And my family has come a long way in terms of coping. Last night, the boys kicked me out of my room, so they could have a sleepover! I slept in Moody's room. I have a busy week ahead of me! I will be in a workshop for 3 days, then going out of town on Wednesday and coming back Friday evening. Work never slows down, it only moves in one direction--up! The kids just went to bed. Moody is so happy... He kept telling me I'm his favorite Mom! And I kept reminding him that I'm his only Mom! He just now told me that I'm his favorite person in the whole world, and that I'm always calm! lol Sweet Moody! Oh, and Obama got the Nobel Prize for Peace?! What's up with that?! And, I was disappointed with the LCROSS lunar impact images, kind of expected more; though it is remarkable to be around when such events take place.